Bluehost vs InMotion Hosting (2019): Here's the Winner! Home » Hosting Reviews » Hosting Comparisons » Bluehost vs InMotion Hosting (2019): Here’s the Winner! Bluehost vs InMotion Hosting (2019): Here’s the Winner! Want to compare Bluehost and InMotion Hosting? Bluehost and InMotion Hosting are 2 of the most popular web hosting providers out there. In our UNBIASED comparison between InMotion Hosting vs. Bluehost, we’ll help you figure out the best choice for your budget and needs. Bluehost is one of the leading web hosting providers on the market. They’re also an officially recommended hosting provider by WordPress.org. They offer a wide variety of hosting options, including shared, VPS, dedicated, WordPress hosting, etc. Bluehost consistently strives for excellence by regularly improving their server hardware infrastructure and providing leading technologies to make sure your website is as fast as it can get. InMotion Hosting is another leading web hosting provider. The best thing about InMotion Hosting is that they offer a lot of desirable features and excellent customer support. They also offer an unmatched 90-day money back guarantee to try their service risk-free. They’ve partnered with Trees for the Future, a non-profit organization dedicated to offset carbon footprints by planting trees. They opened a green data center in Los Angeles in an effort to go green and decrease their carbon footprint. Speed matters because nobody likes a slow website. Your users will abandon your site if it takes a long time to load. Uptime is a term used to describe the period that your website is available and operational. Not to mention, if your website isn’t available 24/7, it’ll tarnish your business and reputation. To check whether Bluehost and InMotion Hosting live up to their uptime promises and hype, we signed up with both hosting services and built a test site with WordPress on each hosting account. To mirror a live site environment on our test site, we added dummy content to it (including images). Pingdom: To analyze the page load time of our test sites. Load Impact: To see how our test sites perform during a traffic surge. According to Pingdom, our Bluehost site took 689 ms to load when tested from New York City. It’s faster than 94% of tested sites. Our InMotion Hosting site took 982 ms to load, which is faster than 90% of tested sites. To get the whole picture of server performance, we also decided to test our testing sites with Load Impact. With Load Impact, we sent some virtual users to our websites and built up to 100 visitors at a time to monitor how the servers would handle it. 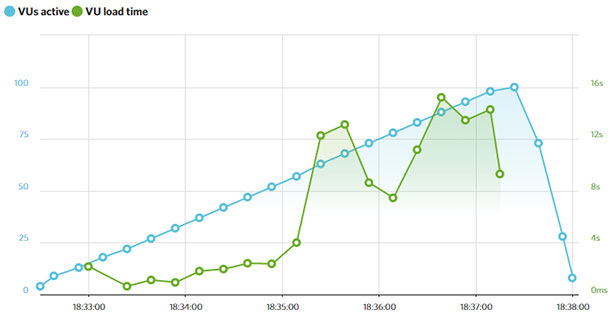 As you can see, for our Bluehost site, a traffic surge didn’t have any negative impact on response time. However, our InMotion Hosting site only performed well until it reached 25 users. After that, it slowed down significantly. Their server’s performance wasn’t consistent throughout the test. 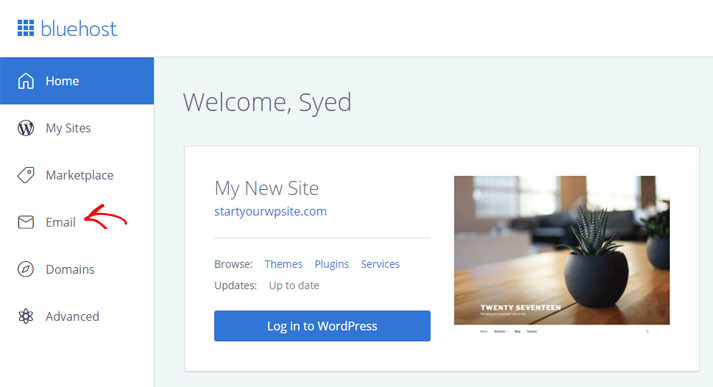 Bluehost constantly revamps their onboarding experience, making it easy for anyone to kick off their WordPress site with ease, regardless of their skillset. They even offer a free domain name and SSL certificate, so even an absolute beginner can quickly launch a website without having to worry about outrageous startup costs. All Bluehost plans come with a cPanel to manage your web hosting account. cPanel is the world’s most popular web hosting control panel. With cPanel, you can manage your web hosting files, domains, and databases all from a single place. 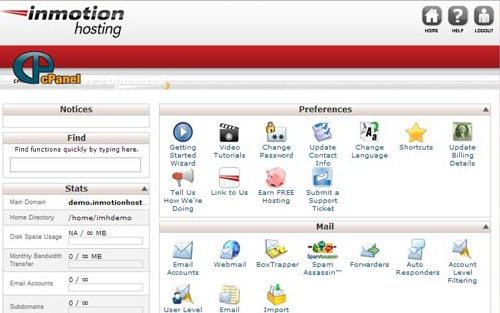 Similarly, InMotion Hosting also offers a cPanel account to all their users. Just like Bluehost, InMotion Hosting also provides 1-click installers for WordPress, Joomla, and Drupal. 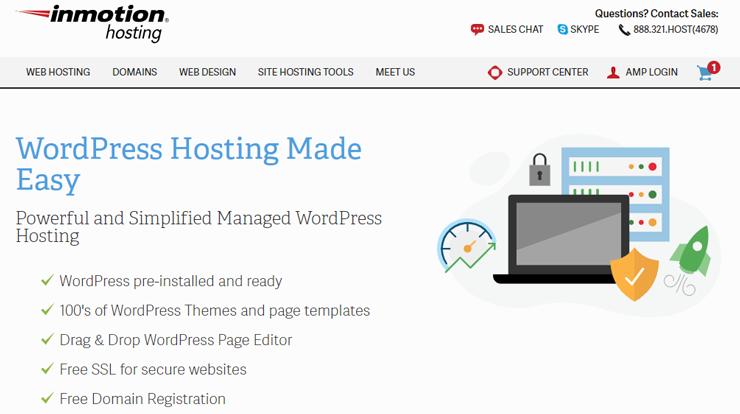 However, in terms of ease of use, we believe Bluehost stands out thanks to the terrific onboarding experience they offer to WordPress users. 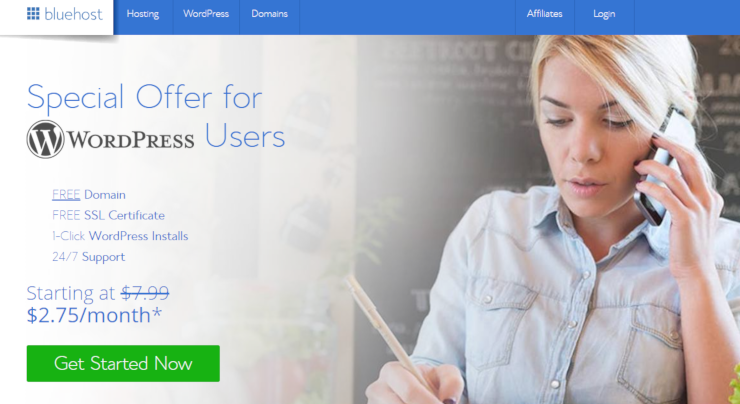 After signing up, Bluehost guides you through every aspect of setting up a website, including installing WordPress, installing a theme, recommending a few must-have plugins, and more. When it comes to features, InMotion Hosting pulls miles ahead of Bluehost. Of course, Bluehost provides you with all the standard hosting features like unlimited bandwidth, free SSL, 1-click installer, etc. However, InMotion Hosting goes above and beyond. Drag and drop builder: BoldGrid is a website builder built on top of WordPress by InMotion Hosting. Choose a data center: When signing up for a hosting plan, they allow you to choose the data center where you’d like to host your site. Free site transfer: They also offer a zero downtime free site transfer when you sign up for their hosting service. 90-day money back guarantee: On top of their features, they allow you to try out their service for 90 days risk-free, whereas Bluehost only offers a 30-day guarantee. Bluehost provides 24/7 support via live chat and phone. They discontinued ticket-based support to focus more on providing direct support to customers. Conversely, InMotion Hosting provides 24/7/365 US-based technical support via phone, live chat, email/tickets, and even Skype! In addition to publishing and updating articles in their knowledge base, they regularly upload video tutorials on YouTube to answer their users’ frequently asked questions. InMotion Hosting plans are slightly expensive when compared to Bluehost. However, with their starter plan, InMotion Hosting lets you build 2 websites; whereas Bluehost allows you to host only one. Bluehost $2.75 / mo. $2.75 / mo. 19.95 / mo. $19.99 / mo. $19.99 / mo. $105.69 / mo. Of course, if you’re looking for the most affordable solution, Bluehost is your best bet. If you’re looking for an affordable hosting provider that comes with all the essential features you need and doesn’t compromise on speed, then we recommend Bluehost. Regardless of your skillset, you’ll find it easy to start a new website with Bluehost thanks to their fantastic onboarding experience. However, if you’re looking for a web hosting provider that includes a ton of additional features, like drag and drop builder, choice of data center, and excellent customer support, then we highly recommend choosing InMotion Hosting. We hope this article helped you decide which provider has the right hosting services for your needs. If you enjoyed this article, you might also want to check out our complete Bluehost review or our in-depth InMotion Hosting review.